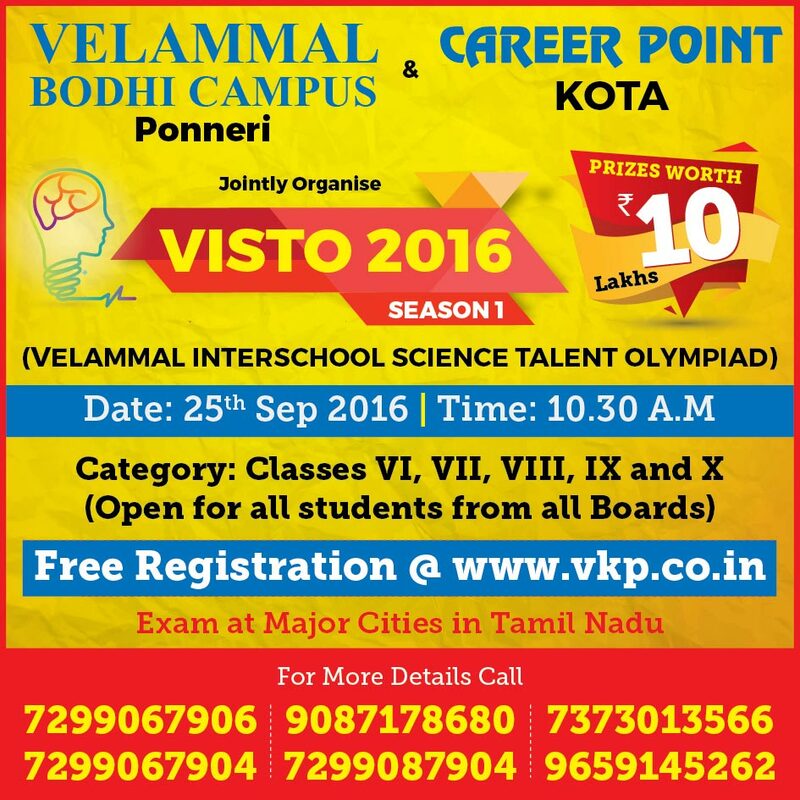 Velammal Inter School Talent Olympiad – VISTO 2016. For students of Std. VI to Std. X. The objective of VISTO is to identify students with talent and aptitude to excel in academics, help them to realize their potential, encourage them to take up ace careers in the field of Science and Technology and ensure the growth of the best scientific and skillful minds for the development of the country. The Question pattern encompasses straight objective type questions, statement type questions, assertion & reason type questions, matching type questions and linked comprehension passage type questions in Mathematics, Physics, Chemistry and Biology. please conduct this VISTO-2017 SEASON 2 before or after 12.02.2017 because I have Dakshin Bharat Hindi Prachar Sabha exams on that day and therefore I don’t want to miss this VISTO- 2017 SEASON 2. This is my kind request. There are many centers given in my city. Which centre should I go? we had registered for visto exam for my son. still now we didnt get any hall ticket or mobile sms. Hall ticket will be given when you reach the exam centre. For my daughter I received a phone call from the organizers yesterday. Hope you will also receive the call soon.